Introduction. Gastrointestinal anastomotic leaks represent a significant source of morbidity and mortality and are frequently associated with extended hospital stays and increased healthcare costs [1-2]. 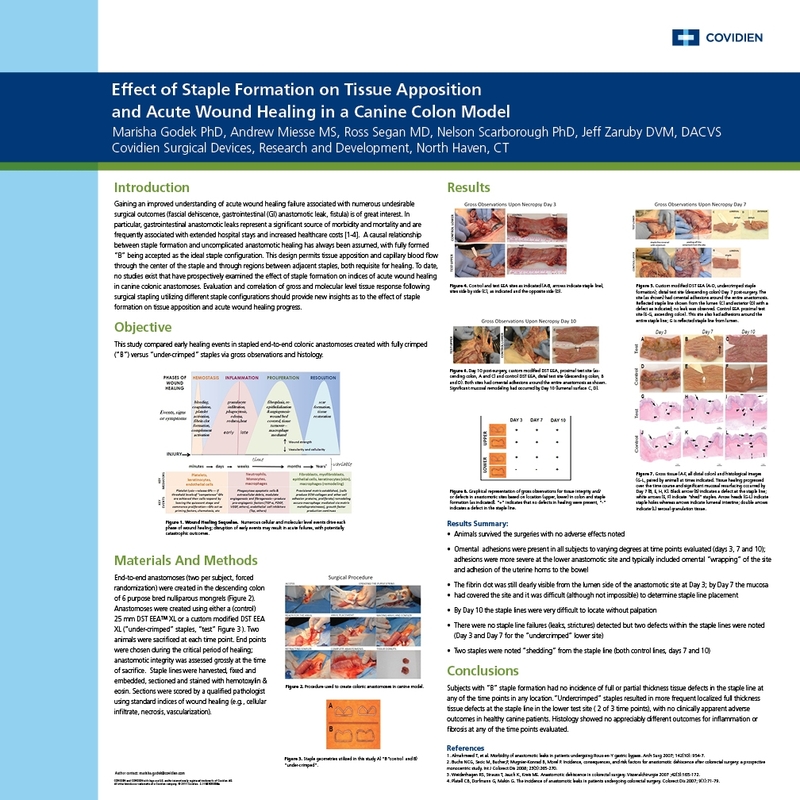 A causal relationship between staple formation and uncomplicated anastomotic healing has always been assumed, with fully formed “B” being accepted as the ideal staple configuration; however, no studies exist that have prospectively examined the effect of staple formation on indices of acute wound healing in colonic anastomoses. Objective. This study compared early healing events in stapled end-to-end colonic anastomoses created with fully crimped (“B”) versus “under-crimped” staples. Materials and Methods. End-to-end anastomoses were created in the descending colon of 6 canines. Using either (control) or modified DST Series™ EEA™ XL (“under-crimped” staples, Figure 1). End points were chosen during the critical period of healing; anastomotic integrity was assessed grossly at the time of sacrifice. Staple lines were prepared and scored by a qualified histopathologist. (e.g., cellular infiltrate, necrosis, vascularization). Results. (Ref. Figure 2) All animals survived without complications. Omental adhesions were present in all subjects to varying degrees; distal anastomoses had more severe adhesions (omentum and uterine horn) than proximal anastomoses regardless of treatment group. Intralumenal fibrin clots were present on all day 3 anastomoses. By day 7 the staple lines were no longer grossly visible from the lumen as the mucosa had migrated over the staple lines. By day 10 the anastomoses were difficult to visualize grossly and were only detectable via palpation. Grossly, no leaks were evident; however, in two of the under-crimped distal anastomoses (one day 3 and one day 7) discreet, focal areas of granulation tissue were observed on the serosal and lumenal sides of the anastomoses. Histological Results. Similar results were observed for test and control sites. Based on scoring criteria, day 3 and 10 results indicate a minor difference in inflammation (under crimped > crimped staples) whereas no difference was observed on day 7. Hemorrhage, necrosis and inflammation all predominated in the day 3 samples, gradually being replaced by increasing amounts of granulation tissue, correlating to gross observations of healing. Conclusions. Undercrimped staples resulted in more frequent localized tissue defects at the staple line, with no clinically apparent adverse outcomes. Histology showed no appreciably different outcomes for inflammation or fibrosis. 1. Almahmeed, T., et al., Morbidity of anastomotic leaks in patients undergoing Roux-en-Y gastric bypass. Arch Surg, 2007.142(10): p.954-7. 2. Buchs, N.C.G., P.;Secic, M.;Bucher, P.;Mugnier-Konrad, B.;Morel, P., Incidence, consequences, and risk factors for anastomotic dehiscence after colorectal surgery: a prospective monocentric study. International Journal of Colorectal Disease,2008.23(3): p.265-270. Figure 1. Staple geometries utilized in this study A) “B”control and B) “under-crimped”. Figure 2. Gross tissue (A-F, all distal colon) and histological images (G-L, paired by animal) at times indicated. Tissue healing progressed over the time course and significant mucosal resurfacing occurred by Day 7 (B, E, H, K). Black arrow (B) indicates a defect at the staple line; white arrows (E, F) indicate “shed” staples. Arrow heads (G-L) indicate staple holes whereas arrows indicate lumenal intestine; double arrows (L) serosal granulation tissue.